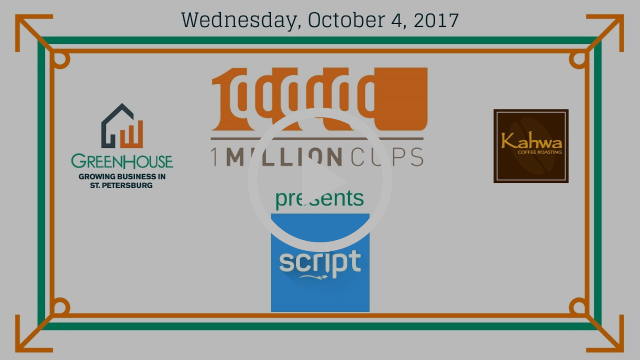 This week, our second #1MCstp presenter was Danny McDonald, introducing us to Script! Script is designed for the K-12 school industry to help educators “teach more and manage less.” Danny began by introducing the problem: “schools waste time and money managing manual paper-driven processes – especially field trips. 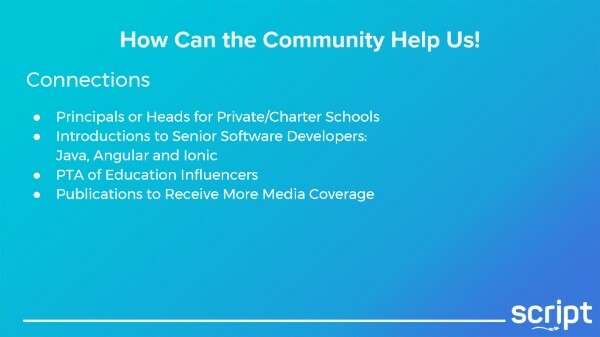 Also, schools are relying on students to be the main form of communication between the school and the parent.” Danny explained the common difficulties parents and teachers have in getting permission slips home, signed, and returned in time, with funds attached. 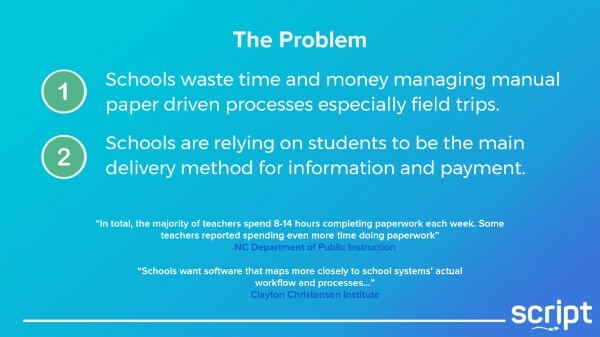 Even when this process is carried out successfully, “schools are now requiring teachers to get all their money counted by a second teacher,” Danny said; “so now they’re asking teachers to become bookkeepers when they went to school to become teachers.” This entire process ends up costing schools a lot of money and wasting teachers’ time. 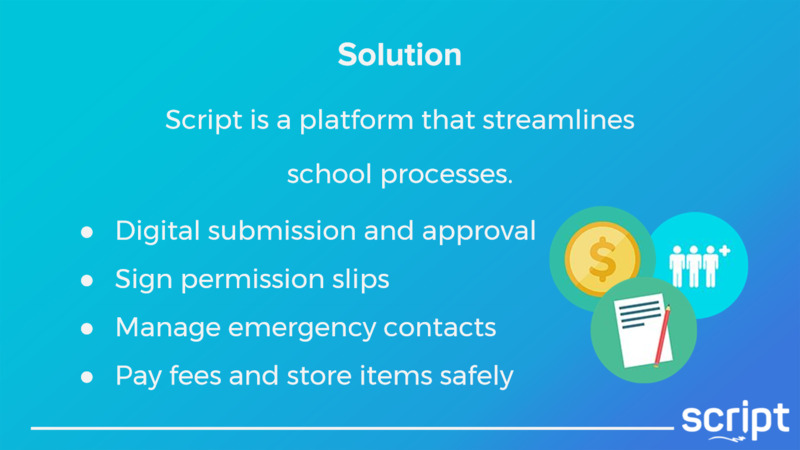 Script solves this problem through their platform “that streamlines school processes” and simplifies digital submission and approval. “We first started with field trips and are now expanding out into aftercare, one-time school purchases, school stores, and more,” Danny said. 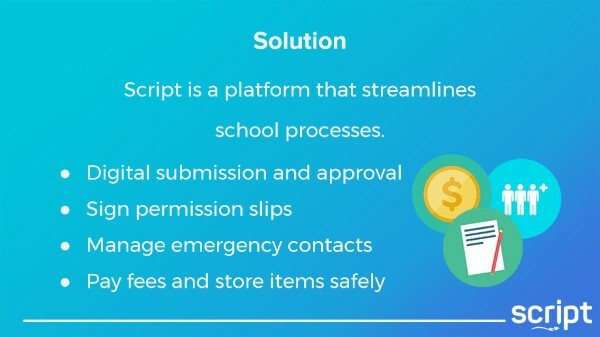 With Script, parents can sign permission slips straight from their phone, manage emergency contacts, and pay for school fees. “There’s no cash, no checks; we’re trying to make sure schools go paperless and cashless,” Danny said. Script consists of two portals – one for parents and one for teachers and administrators. 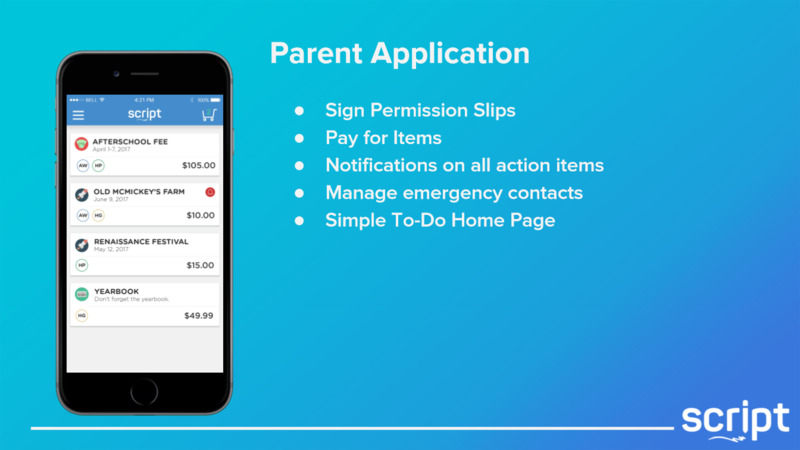 The parent application makes it easy to electronically sign permission slips, pay for items and school fees, and manage emergency contacts. In addition, instant notifications keep parents up-to-date and eliminate the need to check email, postal mail, or search for papers students bring home to receive school communication about action items. In addition, the parent application homepage features a To-Do list. “This is what you need to do for your kid,” Danny said. For teachers and administrators, the Script school portal consists of “a really strong, powerful dashboard that lets administration and teachers get a whole digital permission slip approval process.” This enables teachers to submit ideas and plan for fun field trips with administration “within days instead of what used to be a month’s process,” Danny said. The school dashboard also encourages financial transparency and safety and allows administrators to “generate strong reports so the principal can see all receivables in real-time.” Danny explained that this means they can “see how much money is coming in through parents, how much is coming in through field trips, through clubs, etc. 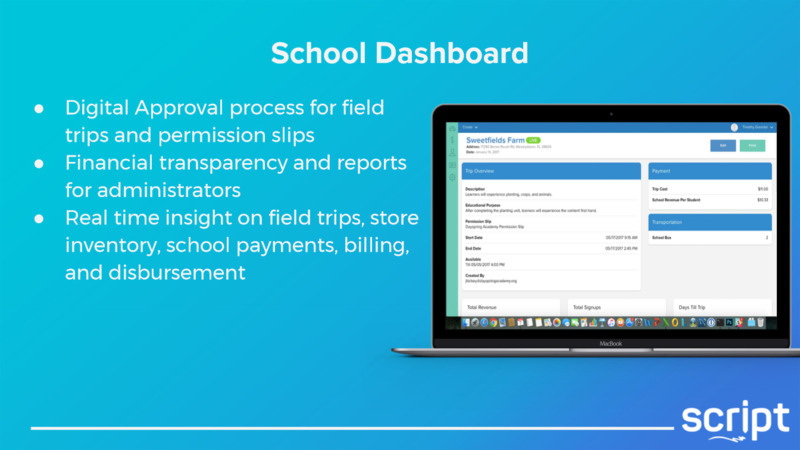 and know exactly how much money is being deposited in the school bank account.” This real-time tracking and reporting give administrators an advantage over traditionally disorganized methods which combine cash, check, and credit card payments. 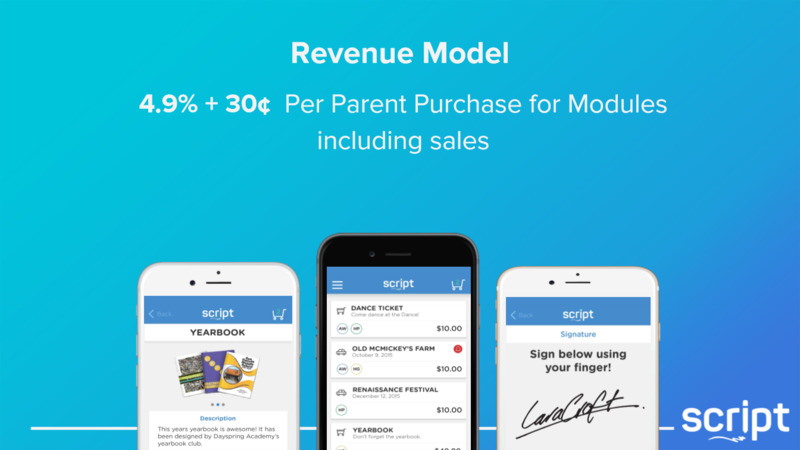 Script also helps schools with proper pricing of items. “Through our pilot school, we found that in the last year, they lost almost $22,000 by not pricing their items accordingly,” Danny said. “They’d lost money by not thinking about the cost of buses or by not passing along processing fees. So what we did is help them price accordingly.” Then, Script charges 4.9% + 30 cents per parent purchase. 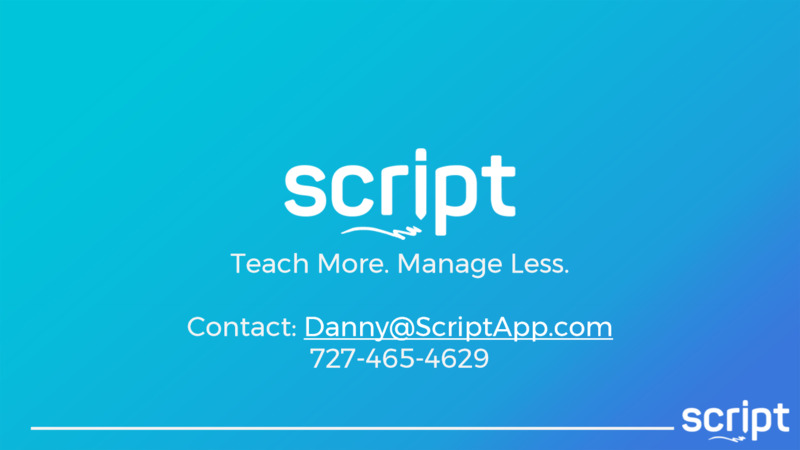 Script has been in existence for 1 1/2 years and is currently in use in 5 schools, including FACE, Dayspring Academy, Pepin Academies, Palmer Ranch Imagine Schools, and Learning Gate Community School. Script is initially targetting the private charter school industry. 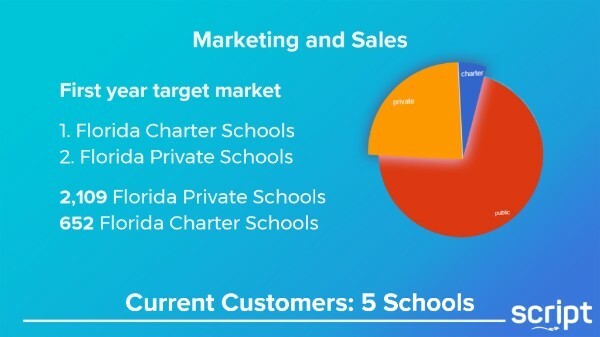 “We’re coming up with some great partners and we have a lot of schools lined up,” Danny said; “we’d love to be in our first Pinellas County school though.” Several of the current schools using Script cater to students with special needs; “Special needs schools love us because we eliminate tons and tons of paperwork” Danny said. Script currently has two main competitors, PermissionClick and ZippSlip. These companies often lack security, though, and they don’t offer payment processing or administrator approval, giving Script an advantage. Currently, Script is based out of Tampa Bay WaVE. 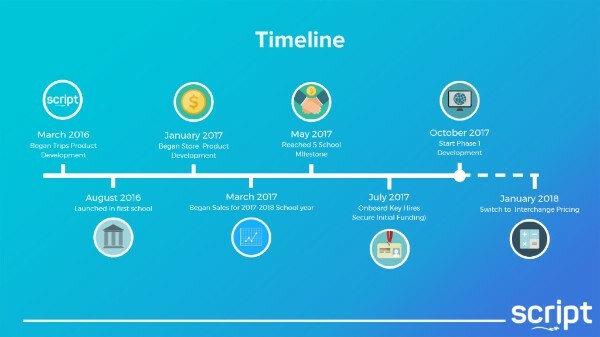 They launched in March 2016 and secured funding in July 2017. They have reached their 5-school milestone this year and recently began Phase 1 Development. By 2018, Script anticipates switching to an interchange pricing model, “which will lower our processing fees,” Danny said. Danny said that Script is primarily looking for connections. They are looking to meet principals or headmasters at private/charter schools. 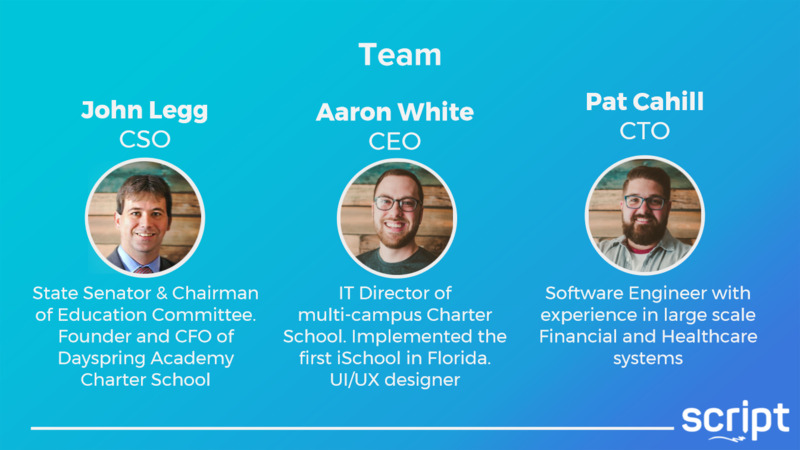 In addition, they are looking for “introductions to senior software developers because we’re hiring. We specialize in Java, Angular and Ionic,” Danny said. They are also looking to meet PTA and education influencers. 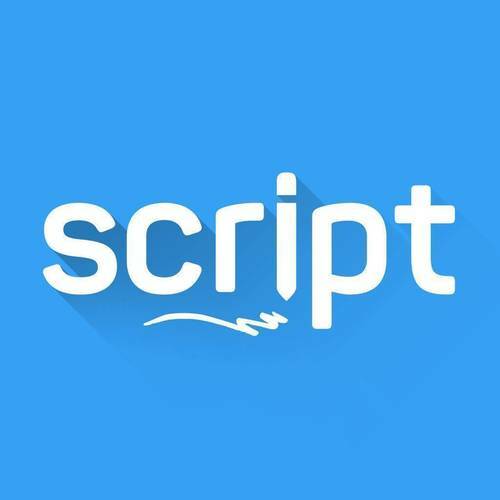 Finally, Script is looking for connections to publications and anyone who can help them obtain more media coverage. If you would like to connect with Danny, he can be contacted atDanny@scriptapp.com or (727) 465-4629.